Lumbland: When you see a good idea - nick it! For some time I have been struggling to find a tangle free way of rigging up a marker float. I've tried different shaped floats, bits of tube, links on the lead, all sorts. None worked with any degree of satisfaction. The other week I spotted an angler's marker rig and a little light went on in my head. I'd tried one cork ball between my big eyed swivel and the float, but not three. As well as acting as an anti tangle device this also adds a fair bit of buoyancy to the float. Trying it out on The Crow Pit it seems to work well, the float only failing to surface when the whole lot got buried in weed and not tangling once. What the plumbing revealed was a small clear patch about twenty yards out. So that was where I kept casting a method feeder and a maggot feeder. Another maggot feeder went down the edge. It soon became apparent that the clear patch was either not all that clear, or it was smaller than I thought. So, the feeder on The Rig had it's hooklength increased to seven inches, and the size sixteen with three live maggots was swapped to a sixteen with three live maggots on the hook and a plastic caster on the hair to give a slower fall. Furthermore I added a bit of PVA foam. Now I have a problem with PVA foam. For some reason it always comes off the hook too quickly for me. So I popped it into some PVA mesh and nicked the hook in that. It worked! I had arrived later than I hoped, starting fishing around one o'clock. Around two thirty I started to get drop backs to the maggot feeder on the clear patch. I suspected roach to be the culprits for some reason. This activity didn't last long, and I couldn't be bothered shortening the hooklink again to get a hook up. After all, I was tench fishing. Out of the blue, at five, the method rod was away. I picked the rod up, felt the fish kick, and with the line under little tension everything went slack. For some inexplicable reason the mainline had parted. I had only recently tied on a fresh hooklength with a 10mm pineapple boilie and a piece of floating plastic corn on the hair. So I can't see it having been knot failure. But you never know. 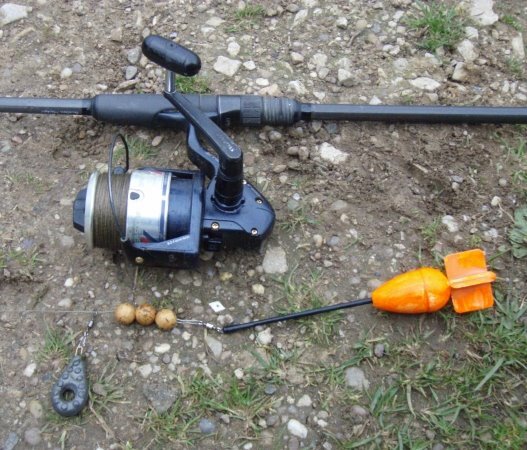 An hour later I was stood by the rods staring vacantly over the water when I hear the thud, dink, clunk, bzzzzzz of an indicator hitting the rod, the line pinging out of the clip, the indicator hitting the rod pod and the baitrunner whirring. The caster/maggot rig was away, and it wasn't a roach. After a decent scrap on the 1lb 10oz Interceptor I had a chunky male tench in the net. For the first time this spring I was able to fish without the bunny suit. Even when I packed up at dark it was still mild, and the light showers hadn't proved an inconvenience, barely requiring the waterproof jacket. 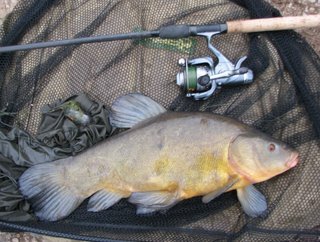 With a first tench from a 'new' water under my belt it had been a good day. I had gone fishing for two reasons. One was because my plans to work Monday to Wednesday morning and fish the rest of the week had been scuppered by the late arrival of rod blanks, limiting me to the Friday only. 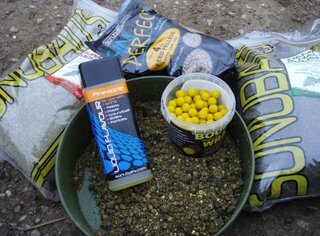 The other was the arrival of some goodies from Sonubaits. They're not really a sponsor as such, I just happen to know someone who works there. Not being much of a bait fiend I actually get more excited by the simple stuff than the latest 'guaranteed' fish catching gimmicky baits. That's why I was keen (as in having run out of groundbait) to try out their method mix and Hemp and Hali Crush which are just what they claim to be and full of 'bits' for the fish to browse on. Add the two together and you have something that should appeal to the tincas. I already had faith in their feed pellets when added to a method mix so some of them joined the two groundbaits in the bowl. I was also sent some 10mm Boosted Wraps in pineapple flavour to try. These are a pretty simple birdfood boilie by the looks of things, but with a peculiar jellylike flavoured coating. 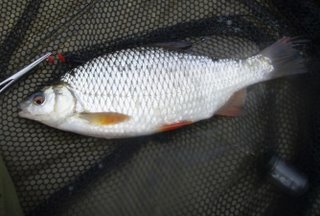 It was one of these, on the method rod, that I lost the tench on. At least I know they don't actively repel fish, so they'll be getting further outings. The groundbaits certainly will.